September 2017: Together with Gianlorenzo D'Angelo, I chaired the program committee of ATMOS 2017, organized as part of ALGO 2017 in Vienna, Austria. We edited the proceedings of the workshop that can be found here. 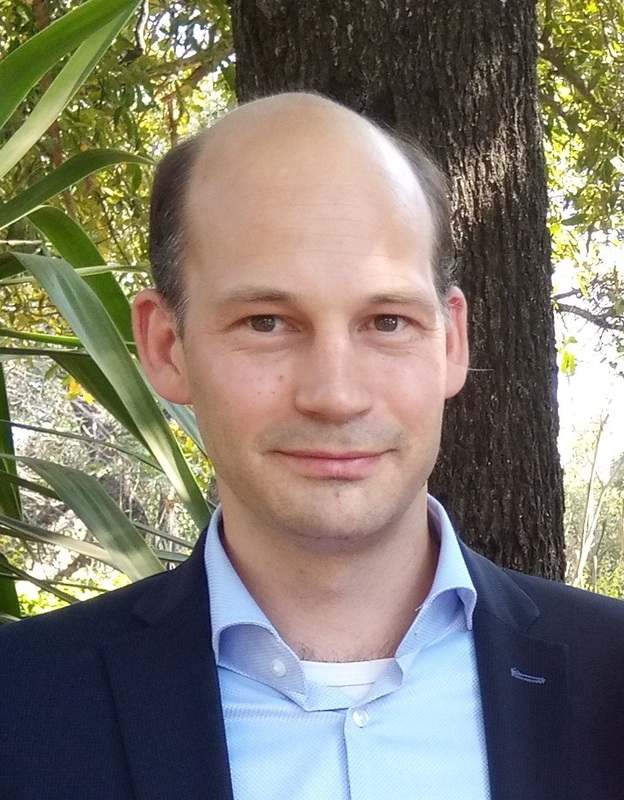 June 2017: On June 15, Paul Bouman defended his dissertation "Passengers, Crowding and Complexity: Models and methods for passenger oriented public transport." On the same day, ECOPT organized the workshop "Analytics and Simulation in Public Transport." Participants from academia and public transport operators attended the workshop. July 2015: Together with several colleagues from RSM, ESE and TU/e, we organised the Conference on Advanced Systems in Public Tranpsort (CASPT) 2015 in Rotterdam. The conference attracted over 200 participants. The program contained more than 130 presentations, a boat trip through the harbor and a conference dinner at the Steamship Rotterdam. 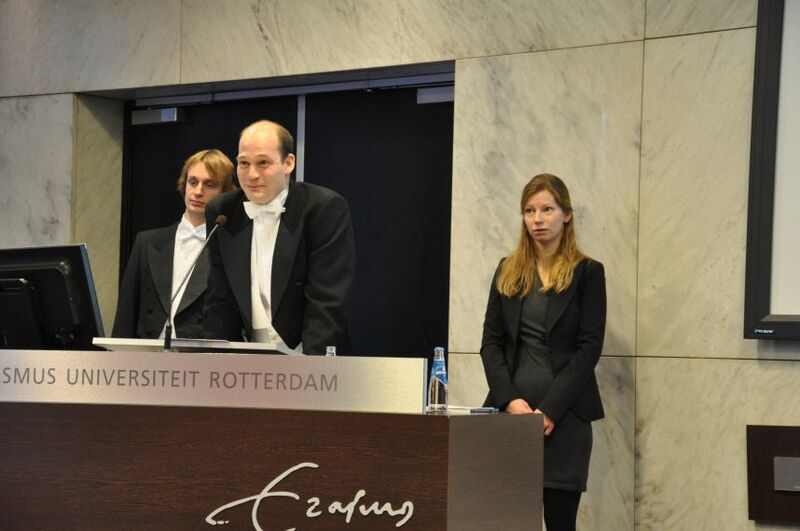 January 2013: I successfully defended my Ph.D. Thesis "Delay Management and Dispatching in Railways" on January 10, 2013, at 13:30. My thesis can be found among my publications. After my defense, I was interviewed in Radio Labyrint, a program about science that was broadcasted on Radio 1 on Sunday January 27. The pictures above are made by Evelien van der Hurk. (Thanks Evelien! :-)). On the left, you see me together with my paranymphs while defending my thesis. 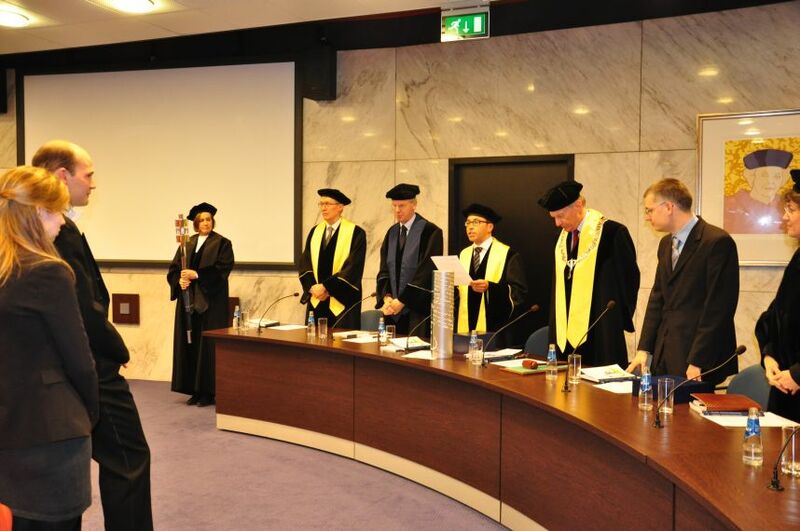 On the right I obtain my doctorate degree from my promotor Albert Wagelmans. On the right, next to the rector magnificus, you see my supervisor Dennis Huisman. More news can be found in the archive. Chongshuang Chen, Twan Dollevoet, and Jun Zhao: "One-block train formation in large-scale railway networks: An exact model and a tree-based decomposition algorithm" (2018) Transportation Research Path B: Methodological 118 pp. 1-30; download here. Twan Dollevoet, J. Theresia van Essen, and Kristiaan M. Glorie: "Solution methods for the tray optimization problem" (2018) European Journal of Operational Research 271:3 pp. 1070-1084; download here. Twan Dollevoet, Dennis Huisman, Leo G. Kroon, Lucas P. Veelenturf, and Joris C. Wagenaar: "Application of an Iterative Framework for Real-time Railway Rescheduling" (2017) Computers & Operations Research 78 pp. 203-217; download here. Thomas Breugem, Twan Dollevoet, and Wilco van den Heuvel: "Analysis of FPTASes for the multi-objective shortest path problem" (2017) Computers & Operations Research 78 pp. 44-58; download here. Lukas Bach, Twan Dollevoet, and Dennis Huisman: "Integrating Timetabling and Crew Scheduling at a Freight Railway Operator" (2016) Transportation Science 50:3 pp. 878-891; download here. Egidio Quaglietta, Paola Pellegrini, Rob M.P. Goverde, Thomas Albrecht, Birgit Jaekel, Grégory Marlière, Joaquin Rodriguez, Twan Dollevoet, Bruno Ambrogio, Daniele Carcasole, Marco Giaroli, and Gemma Nicholson: "The ON-TIME real-time railway traffic management framework: a proof-of-concept using a scalable standardised data communication architecture" (2016) Transportation Research Part C: Emerging Technologies 63 pp. 23-50; download here. Willem van Jaarsveld, Twan Dollevoet, and Rommert Dekker: "Improving spare parts inventory control at a repair shop" (2015) Omega 57, Part B pp. 217-229; download here. Twan Dollevoet, Dennis Huisman, Leo Kroon, Marie Schmidt, and Anita Schoebel: "Delay Management including Capacities of Stations" (2015) Transportation Science 49:2 pp. 185-203; download here. Twan Dollevoet, Francesco Corman, Andrea D'Ariano, and Dennis Huisman: "An iterative optimization framework for delay management and train scheduling" (2014) Flexible Services and Manufacturing 26:4 pp. 490-515; download here. Lanah Evers, Twan Dollevoet, Ana Isabel Barros and Herman Monsuur: "Robust UAV Mission Planning" (2014) Annals of Operations Research 222:1 pp. 293-315; download here. Twan Dollevoet, and Dennis Huisman: "Fast Heuristics for Delay Management with Passenger Rerouting" (2014) Public Transport 6:1-2 pp. 67-84; download here. Twan Dollevoet, Dennis Huisman, Marie Schmidt, and Anita Schoebel: "Delay Management with Rerouting of Passengers" (2012) Transportation Science 46:1 pp. 74-89; download here. Erwin Abbink, Luis Albino, Twan Dollevoet, Dennis Huisman, Jorge Roussado, and Ricardo Saldanha: "Solving Large Scale Crew Scheduling Problems in Practice" (2011) Public Transport 3:2 pp. 149-164; download here. Gert-Jaap Polinder, Thomas Breugem, and Twan Dollevoet: "Robust Periodic Timetabling" (2017) Proceedings of the 7th international conference on railway operations modelling and analysis, RailLille2017. International Association of Railway Operations Research. Egidio Quaglietta, Rob Goverde, Thomas Albrecht, Birgit Jaekel, Grégory Marlière, Paola Pellegrini, Joaquin Rodriguez, Twan Dollevoet, Bruno Ambrogio, Daniele Carcasole, Marco Giaroli, and Gemma Nicholson, "Optimal Management of Railway Perturbations by Means of an Integrated Support System for Real-Time Traffic Control (2015) In IA Hansen, N Tomii & C Hirai (Eds. ), Proceedings of the 6th international conference on railway operations modelling and analysis, RailTokyo2015. International Association of Railway Operations Research. Nikola Besinovic, Valentina Cacchiani, Twan Dollevoet, Rob Goverde, Dennis Huisman, Martin Kidd, Leo Kroon, Egidio Quaglietta, Joachim Rodriguez, Paolo Toth, Luuk Veelenturf, and Joris Wagenaar: "Integrated decision support tools for disruption management" (2015) In IA Hansen, N Tomii & C Hirai (Eds. ), Proceedings of the 6th international conference on railway operations modelling and analysis, RailTokyo2015. International Association of Railway Operations Research. Twan Dollevoet, Marie Schmidt, and Anita Schoebel: "Delay Management including Capacities of Stations" (2011) 11th Workshop on Algorithmic Approaches for Transportation Modelling, Optimization, and Systems; A. Caprara and S. Kontogiannis (Eds) pp. 88-99; download here. Twan Dollevoet, Dennis Huisman, Marie Schmidt, and Anita Schoebel: "Delay Management with Re-Routing of Passengers" (2009) Atmos 2009 - 9th Workshop on Algorithmic Approaches for Transportation Modeling, Optimization, and Systems; J. Clausen and G. Di Stefano (Eds); download here. Gianlorenzo D'Angelo and Twan Dollevoet: "17th Workshop on Algorithmic Approaches for Transportation Modelling, Optimization, and Systems (ATMOS 2017)" (2017) OpenAccess Series in Informatics (OASIcs) Volume 59, Schloss Dagstuhl - Leibniz-Zentrum für Informatik, Dagstuhl, Germany; download here. Twan Dollevoet, Dennis Huisman, Marie Schmidt, and Anita Schöbel: "Delay propagation and delay management in transportation networks" (2018). In: R. Borndörder, T. Klug, L. Lamorgese, C. Mannino, M. Reuther, and T. Schlechte (Eds.) Handbook of Optimization in the Railway Industry (International Series in Operations Research & Management Science, 268) pp. 285-317, Cham: Springer; download here. Twan Dollevoet: "Delay Management and Dispatching in Railways" (2013) Ph.D. thesis, ERIM, Erasmus University Rotterdam; download here. Twan Dollevoet: "Delay Management in Railway Operations" (2010) Medium Econometrische Toepassingen, 18:1 pp. 2-5. Rowan Hoogervorst, Twan Dollevoet, Gábor Maróti, and Dennis Huisman: "Reducing Passenger Delays by Rolling Stock Rescheduling" (2018). Submitted in December 2018; download here. Gert-Jaap Polinder, Thomas Breugem, Twan Dollevoet, and Gábor Maróti: "An Adjustable Robust Optimization Approach for Periodic Timetabling" (2018). Submitted in December 2018; download here. Thomas Breugem, Twan Dollevoet, and Dennis Huisman: "Analyzing a Family of Formulations for Cyclic Crew Rostering" (2018). Submitted in October 2018; download here. Thomas Breugem, Twan Dollevoet, and Dennis Huisman: "Is Equality always desirable? Analyzing the Trade-Off between Fairness and Attractiveness in Crew Rostering" (2017). Submitted in November 2017; download here. I am an associate professor at the Econometric Institute of the Erasmus School of Economics, Erasmus University Rotterdam. My research focuses on applications of combinatorial optimization, most notably in railway optimization, or transportation in general. For my Ph.D. thesis, I have developed several extensions of the classical delay management model. After my graduation, I have been working on online delay management and integrated disruption management within the European project ON-TIME. Some of the project I am or have been working on are described below. Together with Thomas Breugem and Dennis Huisman, I am working on railway crew planning. We are currently incorporating fairness aspects in the traditional crew rostering approaches. Together with Rowan Hoogervorst and Dennis Huisman, I am working on rolling stock rescheduling. In particular, we are incorporating delays and adding rescheduling flexibility into existing approaches. Together with Pedro Munari and Remy Spliet, I work on a generalized formulation for Vehicle Routing Problems (VRPs). The generalized formulation includes the arc-flow and set partitioning formulations as special cases. A preliminary report on this research can be found on ArXiV. Together with Diego Pecin and Remy Spliet, I am studying all kinds of extensions of this idea. Lukas Bach, a Ph.D. student at Aarhus University, has visited Erasmus University Rotterdam several times since April 2013. Together with Lukas and Dennis Huisman, I work on the integration of train timetabling, engine routing and crew scheduling for a real-world case of DB Schenker, Rail Scandinavia. By allowing for some flexibility in the timetale, the overall costs of the timetable and crew schedule could be reduced by 6-8 percent. A paper on this research has been published in Transportation Science. I have collaborated with some of my former fellow PhD students. Together with Willem van Jaarsveld, I have looked into an algorithm to solve multi-item inventory problems. We have written a paper on this project that has been published in Omega. Together with Lanah Evers, I have been working on robust solutions to the orienteering problem. Our paper on this research is published in a special issue of Annals of Operations Research. Together with Kristiaan Glorie and Theresia van Essen, I have studied the Tray Optimization Problem (TOP). Here, sterile intruments must be grouped into nets and are then assigned to surgeries. A paper on this research is published in European Journal of Operational Research. When I was a Ph.D. student, I have worked part-time on crew scheduling at Netherlands Railways (NS). In cooperation with SISCOG, we have developed an algorithm that can tackle the crew scheduling problem for a whole week at once. One of the main results is a crew scheduling algorithm that can solve complete week instances both for drivers and for guards. A paper on this algorithm has been published in Public Transport.